On twitter this pm is a not unexpected, but rather interesting looking opportunity for those who are confident about their leadership abilities. I know what you are thinking, £95k sounds pretty good, but what would you have to do for it? Posted in Science. Tags: BAS, British Antarctic Survey, Dream job, Natural Environment Research Council, NERC, polar on December 21, 2012 by Mark Brandon. 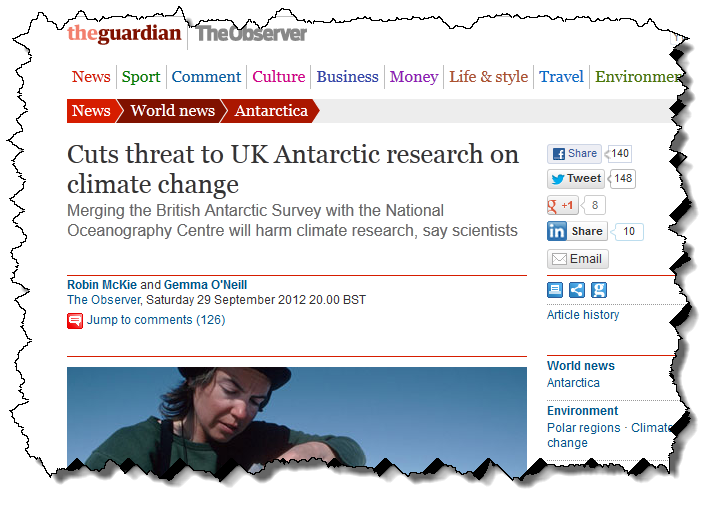 I am a huge fan of the Natural Environment Research Council, and used to work for the British Antarctic Survey. It is a fact that in the UK at the moment the community has some very tough funding decisions to make. NERC decided to investigate saving money through a possible merger of the National Oceanography Centre and BAS. It is fair to say that this was not so well recieved. Posted in Science, Storify, twitter. Tags: Antarctic, BAS, British Antarctic Survey, National Oceanography Centre, NERC, NOC, polar, policy on December 7, 2012 by icey_mark.